Evangelical Christians have long been the foot soldiers of the Republican Party. In 2010, they made up about 36 percent of Republican voters. But the GOP’s reliance on religious voters isn’t necessarily a formula for long-term success—especially since the next generation of Americans has serious reservations not just about organized religion, but about the very existence of God. 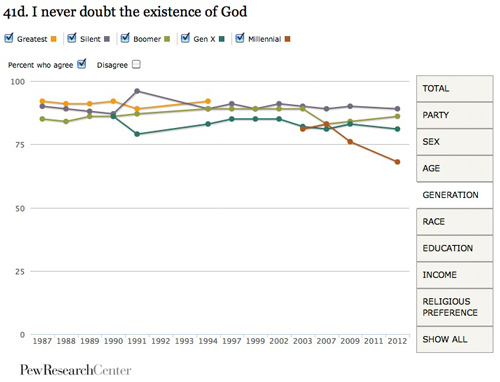 For the past 25 years, the Pew Research Center has been asking voters whether they ever question the existence of God. The numbers have been pretty stable. Older voters are pretty set on God, with 86 percent of baby boomers saying they never question His existence. But Millennials, defined as Americans born after 1981, are bending the curve. This year, only 68 percent of Millennials surveyed said they never questioned God’s existence, the lowest number of any group in 25 years. That’s down from 76 percent only five years ago. The numbers suggest Millennials are going to be a generation of skeptics. No other generation has seen such a dramatic crisis of faith in such a short time. The trend lines join other bad polling news for evangelicals, namely that younger Christians are turned off by attacks on gays and lesbians. Such trends don’t bode well for the Republican Party. By 2020, Millennials will make up the largest single voting bloc in the country, some 90 million strong, and they are already showing a distaste for GOP politics. Evangelical political activists like Ralph Reed have contended that these sorts of numbers don’t mean the movement is in a death spiral. Reed has scoffed at polling data showing younger people fleeing the religious right. “Young people may start out liberal, but once they start getting married, having babies, and paying taxes, we got ’em,” he told me after the 2010 midterm election. Is Nine Months Long Enough for Evangelicals to Learn to Love Romney?